Description: The book of Hebrews presents interpretive challenges and theological comparisons unrivaled in the New Testament. 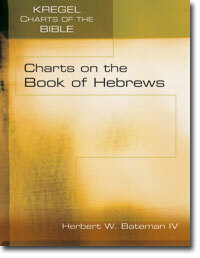 Charts on the Book of Hebrews puts this demanding yet rewarding information in an accessible and useful format. The charts fall into four categories: 1. Introductory matters (e.g., authorship of Hebrews) 2. Influences in Hebrews (e.g. Second Temple messianic figures) 3. Theological issues (e.g. words of exhortation) 4. Exegetical concerns (e.g. figures of speech) Students will find this an invaluable companion to classes on Hebrews. Pastors and teachers will benefit from these insightful charts to quickly clarify difficult concepts while teaching. And all visual learners will find that these charts make Hebrews more comprehensible. Citation: Philip Church, review of Herbert W. Bateman, Charts on the Book of Hebrews, Review of Biblical Literature [http://www.bookreviews.org] (2014).